Does autologous blood transfusion during liver transplantation for hepatocellular carcinoma increase risk of recurrence? Autologous intraoperative blood salvage (IBS) is used routinely in many surgical specialties to minimize the effects of intraoperative bleeding, avoiding the risks of allogeneic red blood cell (RBC) transfusion. A recent cochrane review showed a 40% reduction in the requirements for allogeneic blood transfusion with cell salvage. IBS has been generally used in liver transplantation (LT), although it is not usually recommended in patients with hepatocellular carcinoma (HCC) since there is a putative risk of reinfusion of neoplastic cells. The IBS is an alternative to allogeneic blood transfusion but it remains a controversial technique in oncologic procedures since it could represent an uncertain risk of malignant cell reinfusion[2–5]. The circulation of viable neoplastic cells in the IBS device and their detection in the leukocyte depletion filter (LDF) have been proved, and LDF has been used as an effective method to clean the RBC component before infusing it back[5–9]. Although the rationale to use LDF to block neoplastic cells back by the IBS device has been investigated on experimental studies, the clinical relevance analysis over patients who underwent LT for HCC has been restricted to a single study. In the latter case, no differences were observed in recurrence between patients who received IBS and those who did not. However, it was not possible to rule out the possibility that this result was a consequence of a small sample size. The aim of this study was to evaluate if the use of IBS for HCC patients who underwent LT increases the risk of tumor recurrence. To our knowledge, this is the largest series addressing this question in this population. Patients submitted to LT for HCC at Hospital das Clínicas of University of São Paulo Medical School (HCFMUSP) were analyzed from a prospectively maintained database containing demographic, clinical, operative, pathological, and follow-up data and studied retrospectively. Permission was obtained from the informed consent statement and institutional review board according to the institutional policy for protected health information. All patients presented in this analysis were initially considered to meet the Milan criteria or UCSF criteria[10,11]. Patients who had detectable extra-hepatic disease during the pre- or intraoperative course and patients with a concurrent second neoplasm were not included. Patients who did not present HCC in the specimen were excluded with the exception of those previously treated with radiofrequency or chemoembolization. Pre-operative imaging modalities to evaluate the extent of intrahepatic disease and to exclude extra-hepatic metastatic sites included computed tomography and/or magnetic resonance imaging of the chest, abdomen, and pelvis. Model of end-stage liver disease (MELD) scores were calculated using laboratory results collected prior to the LT. The MELD score was calculated using the standard UNOS formula: MELD = 3.78 × ln (bilirubin) + 11.2 × ln (INR) + 9.57 × ln (creatinine) + 6.43, where bilirubin and creatinine are in mg/dL units and INR is the international normalized ratio. The MELD score was analyzed separately as both continuous and categorical variables (i.e., ≥ 20 vs <20). The estimated blood loss was not fully available and thus it was not described and analyzed. The intraoperative decision to transfuse either allogeneic or autologous blood was consensual between the surgeon and the anesthesiologist. It was based on hemodynamic status, blood loss, hemoglobin concentration and patient’s comorbidities. Follow-up time was calculated from the date of LT to the date of last clinical encounter captured by the HCFMUSP medical record system or the date of death. Recurrence-free survival (RFS) was calculated from the LT to the first detected recurrence or last follow-up without recurrence. Overall survival (OS) was calculated based on the survivorship status (deceased or alive) at last follow-up. The blood from the surgical field was collected using a Cell Saver auto-transfusion device (Fresenius C.A.T.S, Terumo Cardiovascular Systems, Germany) and anti-coagulated with heparinized saline and stored. The RBC component of aspirated blood was centrifuged and washed with heparinized saline. The RBC concentrates were filtered through an LDF (FTS-RC202, Shuangweibio Corp., Nanjing, China). Processed RBCs were transfused back to the patient when appropriate. Statistical analyses were performed using the Fisher’s exact test and the Wilcoxon rank sum test to examine covariate differences between patients who underwent IBS and those who did not. Values are expressed as median (interquartile) or percentage, as appropriate. Survival probabilities were estimated using the Kaplan-Meier method and compared using the Log-Rank test. A Cox regression model was developed to determine factors independently associated with death. The use of IBS was included in the multivariate analysis regardless of its univariate significance. Other factors that were significantly associated with outcomes by univariate analysis (inclusion criterion, P≤ 0.1) were entered into a multivariate analysis to test for significance of IBS adjusting for possible confounders. For recurrence assessment, no Cox regression was used since the number of events per variable was not appropriated[12,13]. A P value < 0.05 was considered significant for univariate and multivariate analyses. All statistical analyses were conducted using STATA v 9.0 (Stata Corp, College Station, TX). Between January 2002 and September 2012, 158 consecutive patients who underwent potentially curative LT for HCC were included. One hundred and twenty-two (77.2%) patients in the IBS group and 36 (22.8%) patients in the non-IBS group were compared. Patients and clinicopathological presentation were compared between groups and are summarized in Table 1. Briefly, the demographic and clinicopathological characteristics were comparable between the two groups. The only significant difference was the presence of liver cirrhosis, which was more prevalent in the non-IBS group (100% vs 84.8%, P = 0.014). Table 1 Clinicopathological distribution according to the use of autologous intraoperative blood salvage for patients with hepatocellular carcinoma who underwent liver transplantation. 6N = 147. BMI: Body mass index; AFP: Alpha-feto protein; MELD: Model of end-stage liver disease. The median follow-up time for all patients was 27 mo; 25 mo for the group who received IBS and 32 mo for the group who did not (P = 0.049). 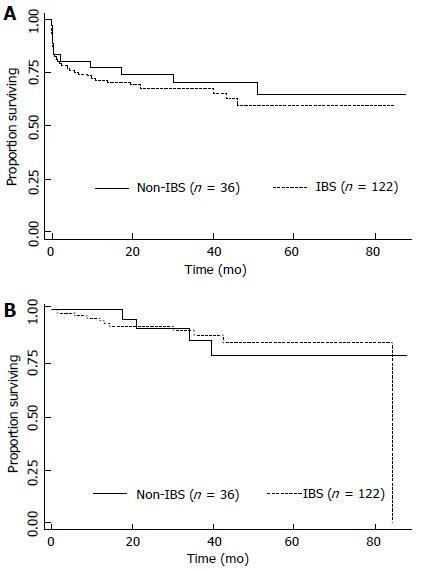 The median follow-up time for survivors was 38 mo; 37 mo for the group who received IBS and recurred and 41 mo for the group who did not (P = 0.017). The estimated 3- and 5-year OS rates were 68% and 59.7%, respectively. When OS was adjusted for the use of IBS or not, no difference was detected (P = 0.51), as depicted in the Figure 1A. The univariate and multivariate analyses for death were performed and are shown in Table 2. Briefly, no differences were detected according to MELD either as a continuous variable (recurrence, P = 0.633; death, P = 0.286) or as binominal, as demonstrated in Tables 2 and 3. Only elevated Edmond-Steiner degree of tumor differentiation (III-IV) remained significant for the risk of death, as shown in Table 2. The estimated 3- and 5-year RFS rates were 87.7% and 83.3%, respectively. When RFS was adjusted for the use of IBS or not, no difference was detected (P = 0.953; Figure 1B). The univariate analysis for recurrence is shown in Table 3. Briefly, elevated Edmond-Steiner degree of tumor differentiation (III-IV), pre-operative alpha-feto protein level equal to or higher than 100 ng/dL and presence of microsatellite lesions were independent predictors of recurrence, as demonstrated in Table 3. Figure 1 Kaplan-Meier estimates of survival from the date of liver transplantation according to the use of autologous intraoperative blood salvage. A: Overall survival (P = 0.51); B: Recurrence free survival (P = 0.953). IBS: Intraoperative blood salvage. Table 2 Univariate and multivariate analyses for predictors of overall survival. BMI: Body mass index; AFP: Alpha-feto protein; IBS: Intraoperative blood salvage; MELD: Model of End-Stage Liver Disease. The number of patients included in multivariate model is 141. Figure 2 Scatter plots of the infusion volume of autologous intraoperative blood salvage over time. Overall distribution (total, n = 122) according to the time for recurrence (A: Recurrence, 10/91) and death (B: Death, 41/92). Distribution at 90 d and longer according to the time for recurrence (C: Recurrence, 9/91) and death (D: Death, 15/92). IBS: Intraoperative blood salvage. Table 3 Univariate analysis for predictors of recurrence. BMI: Body mass index; AFP: Alpha-feto protein; IBS: Intraoperative blood salvage; MELD: Model of End-Stage Liver Disease. 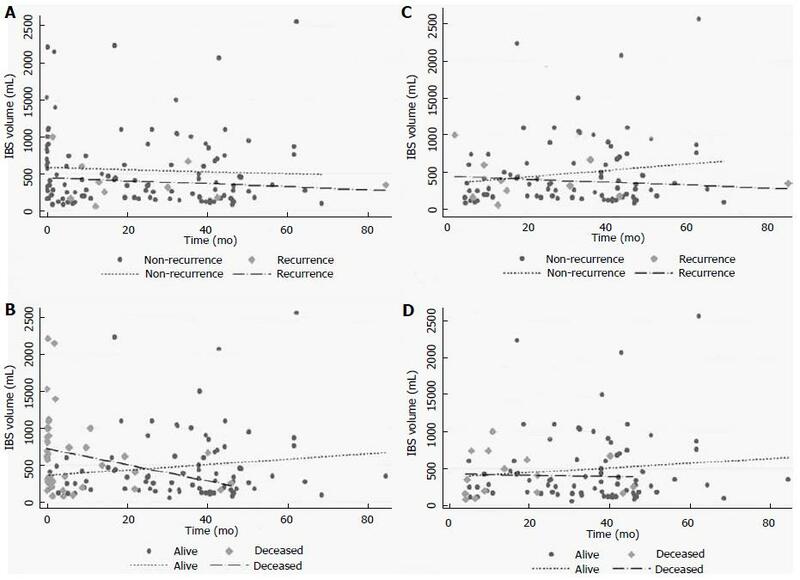 Regarding the group of patients who received IBS (122 patients), the infusion volume was additionally analyzed as a continuous variable, and no differences were found in either recurrence (P = 0.512) or death (P = 0.055), as demonstrated in Figure 2A and B. Analyses of outcomes at 90 d or longer were performed and no differences in recurrence (P = 0.518) or death (P = 0.518) were detected (Figure 2C and D). The IBS is largely accepted as an option for blood transfusion. However, the contra-indications are based on the use of contaminated blood as in chronic diseases like hepatitis or other viral infections, bile infection or colonization, and intra-operative contamination[4,8]. The same rationale is applied to avoid tumor dissemination in patients with liver cancer already identified. Although this apprehension has been justifying its practice, no clear relation between the use of IBS and cancer recurrence has already been proved. Operations with high blood loss including cancer surgery have been demanding IBS use, however retrospective series did not show any suggestive association between the increase of recurrence and IBS use. Concerning HCC patients, IBS use was described in a few series for resection and LT. One series described no increase in recurrence with IBS, showing no differences in higher stages and even better results for patients who used IBS in early stage disease[15,16]. Two series of LT, respectively, with 31 and 40 patients in the IBS groups vs 16 and 96 patients as control group, were described[17,18]. Despite the theoretical risk of tumor cell dissemination, the recurrence rates were not increased by IBS use in both series[17,18]. The purpose of our study was to compare long-term outcomes for patients undergoing LT for HCC who received IBS or not. In our study population, the groups were comparable except for the remarkable presence of cirrhosis in the IBS group. As expected, patients with cirrhosis are technically challenging and the blood loss is usually elevated, more justifying IBS. With regard to oncologic outcomes, the use of IBS or not was not significantly associated with recurrence or death. The predictors associated with recurrence were presence of satellite lesions and elevated Edmond-Steiner tumor degree. This was also an independent predictor of death in the multivariate model. The principal finding of this study is that in a large patient population from a single institution there were no measurable differences in outcomes based on the IBS use for patients who underwent LT for HCC. Regarding only the IBS group, differences in the volumes infused were associated with death but not with recurrence, as depicted in Figure 2. The volume infused changed when the time point of 90 d was used. In the earlier period, higher volumes were associated with death but not with recurrence. This performance translates the IBS volume as surrogate of estimated blood loss, which is an independent predictor of mortality and transfusion as well. Patients in the earlier period died in a short follow-up period and they could not have presented recurrence. With regard to longer follow-up (90 d or longer), the IBS volumes fit similarly for the distribution of recurrence or death. Long-term outcomes were not affected for the IBS volume in our series. The limitations of the study are those associated with the immeasurable biases seen in all retrospective studies. We recognize that selection bias based on several nonobjective, undocumented criteria may have contributed to some of the differences between the two study groups. The estimated blood loss was not fully available and thus it was not described or analyzed. The major finding of this analysis is the lack of any association between the use of IBS and oncologic outcomes. The results of this study should not be misinterpreted as an endorsement for the IBS use for all cancer patients. On the contrary, our data claim for more translational and clinical investigations of this issue. The operative hemorrhage in LT remains significant and blood transfusion is often demanded. The IBS should be applied as much as necessary, however the rationale of tumor cell reinfusion is a common concern[4,14,17,18,20–22]. Studies in vitro and retrospective series suggest that the use of LDF is effective enough to avoid tumor cell recirculation[5–7]. We believe that this finding is convincing and perhaps it is a reasonable explanation for no differences in recurrence or death in our series, since the LDF was used in all cases. Moreover, a recent meta-analysis, including only non-randomized trials, showed an increase of risk for death and recurrence in patients with HCC who received allogeneic blood transfusion during hepatic resection. Patients in the allogeneic group had a 16% more chance of recurrence at 5 years as well as a 60% more chance of all-case death in the same period. The reasons for the worse outcomes remain uncertain but it has been assumed that suppressive effects in the host immune system may have been responsible. The postulated mechanisms are allogeneic mononuclear cells; leucocytes-derived soluble mediators; and soluble HLA peptides circulating in allogeneic plasma inducing the host immune suppression. These effects could be prevented by the autologous transfusion. In summary, the present study shows that in a large consecutive series of patients undergoing LT for HCC in this single institution, there were no measurable differences in RFS or OS between patients who received IBS or not. With the lack of randomized clinical trials comparing the use of IBS for oncologic patients, its use could be considered a reasonable option for individualized patients. Based on these data, a trial looking for no inferiority comparing the use of IBS and conventional blood transfusion for LT for HCC is justified and should be designed to detect small differences in outcomes. Blood transfusion is usually necessary for liver transplantation (LT). Intra-operative blood salvage has generally been used in LT to avoid deleterious effect of allogeneic blood transfusion. However, autologous blood transfusion has not been recommended in patients with hepatocellular carcinoma (HCC) since there is a putative risk of reinfusion of neoplastic cells. Although there is a putative risk of reinfusion of cancer cells into circulation during surgery, there is no data yet demonstrating that it would really impact on oncologic outcomes. This study did not demonstrate impact on clinical and oncologic outcomes. However, since the data are retrospective, our finding claims for trials looking for no inferiority comparing the two modalities of blood transfusion in patients who underwent LT for HCC, to detect small differences in outcomes. This study addresses an alternative option for allogeneic blood transfusion during LT for HCC. The autologous blood salvage in LT, in this series, did not impact recurrence or death. This suggests that autologous blood transfusion should be considered an option avoiding the deleterious effects of allogeneic blood transfusion. IBS: Autologous intraoperative blood salvage; HCC: Hepatocellular carcinoma; LDF: Leukocyte depletion filter; LT: Liver transplantation; MELD: Model of End-Stage Liver Disease; OS: Overall survival; RFS: Recurrence free survival; RBC: Red blood cell. Autologous IBS is generally used in liver transplantation to minimize the effect of intraoperative bleeding. However, the peripheral blood of HCC patients may be contaminated with cancer cells or cancer-inducing virus, which can lead to potential risks of recurrence. In this study, authors investigated the association between the intraoperative use of IBS and survival of HCC patients. According to the data of a postoperative follow-up cohort, they reported that the use of IBS cannot influence the survival of HCC patients. This is an interesting study and is useful for clinicians.